We welcome you to a day-long retreat with talks from experts in the field of Neuroimaging and present your work. The symposium is free but one must register. Please click this link to register. If you need more information please contact Neuroimaging.md@gmail.com. Announcement for abstract submission will follow. We would appreciate it if you could pass on the information to your colleagues who may be interested. See the Info Poster. Thank you and look forward to seeing you at the retreat. Gannet is a software package designed for the batch analysis of edited magnetic resonance spectroscopy (MRS) data. A new website has been designed and is online providing downloads, a blog, examples and contact information. Check it out at http://www.gabamrs.com. Dr. Tilak Ratnanather, associate research professor of Biomedical Engineering and core faculty member of the Center for Imaging Science, is featured on the cover of the Johns Hopkins Whiting School of Engineering Magazine Winter 2016 release. Inside, a four-page article entitled, “Can You Hear Me Now?” expounds upon his tireless efforts to increase the number of deaf and hard-of-hearing students in STEM fields at the undergraduate and graduate levels. Tilak believes that those who might be the most effective at doing research to help the deaf are the deaf themselves. He has mentored dozens of hearing impaired students, many of which have moved on to pursue careers as engineers, researchers, and physicians. 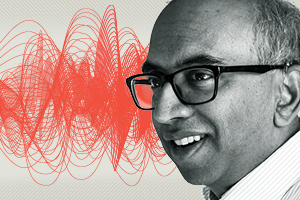 Since beginning his mentorship movement, with the help of others, the number of deaf researchers in auditory sciences has expanded significantly. As of 2015, there were 10 hearing impaired faculty members in the auditory sciences nationwide, with another 15 pursuing graduate programs in the field. It’s no coincidence that Tilak knows them all. For the full Whiting School Engineering Magazine feature, click here. Our recent paper in PLOS ONE, entitled "Reproducibility and Temporal Structure in Weekly Resting-State fMRI over a Period of 3.5 Years," was described as a "monumental step towards validation of fMRI" in a PLOS editor's blog. Michael I. Miller, Ph.D., Herschel and Ruth Seder Professor, Director, Center for Imaging Science, has been recognized as one of the "Influential BioMedical Engineering Professors Who Teach Online" by onlineengineeringprograms.com. The online resource lists Dr. Miller and Johns Hopkins University among the number of highly regarded universities which offer online biomedical engineering programs. Click here to view. New paper published in Brain: Reduced gamma-aminobutyric acid concentration is associated with physical disability in progressive multiple sclerosis Cawley N, Solanky BS, Muhlert N, Tur C, Edden RA, Wheeler-Kingshott CA, Miller DH, Thompson AJ, Ciccarelli O., Brain. 2015 Sep;138(Pt 9):2584-95. doi: 10.1093/brain/awv209. The new Kavli Neuroscience Discovery Institute at The Johns Hopkins University, expected to launch in early 2016, will bring an interdisciplinary group of researchers together to investigate the workings of the brain. The Kavli Neuroscience Discovery Institute, to be funded by a joint $20 million commitment by Kavli and Johns Hopkins, is designed to integrate neuroscience, engineering, and data science—three fields in which the university has long excelled—to understand the relationship between the brain and behavior. The Johns Hopkins Institute for Computational Medicine, acclaimed worldwide for its groundbreaking research, has launched the nation’s first undergraduate minor in the emerging field of computational medicine. The minor course of study exposes students to the fundamentals of computational medicine—a discipline devoted to the development of quantitative approaches to understanding the mechanisms, diagnosis, and treatment of human disease. Click here to view the full Johns Hopkins press release on the Hub website.